Hi Steven, and once again many thanks for accepting to answer a few questions about your career, the upcoming WBC and Australian Baseball. First, could you tell us about your baseballing-journey. How does a strong-built, tall Australian kid become a professional baseball pitcher in the country of Cricket, Aussie-Rules and Rugby? I was pretty much born into baseball. My dad actually played cricket growing up but one day, when he was 9 years old, his coach didn’t show up to practice and by coincidence this was right around the time baseball in Canberra was starting up. The baseball team was training on the field next to where his cricket practice was so he wandered over and joined in and has never stopped playing since. He’s now 60 and still playing! I grew up going to all my dad’s games and just fell in love with the sport. I also played soccer and Aussie rules football growing up but it was really only so I had a sport to play in winter. Baseball was always the sport I truly loved. Whenever someone asked me what I wanted to be when I grew up, I always said I wanted to be a baseball player. You were only 17 when you were scouted and signed by the Atlanta Braves organization in 2006. In the following five years, you experienced all the high and lows of Baseball, making yourself a Top Prospect in the Braves’ Farm System, before eventually being released in 2011. Was it too early for you? I was actually 16 when I headed over to the US for my first season and looking back I was just a kid. But for me personally I don’t think I was too young. When I was 16 I was already fairly physically mature for my age. I was never daunted at the prospect of leaving my parents, I really felt like I was ready. I had some really good seasons at the beginning of my career so I also don’t think I was overmatched. The only thing I really didn’t like about being so young over there was I sometimes felt like I got held back a little bit because I was younger than everyone else. I don’t think I could give blanket advice to young players as to whether you should head over at 16 or not, I think it needs to be looked at on a case-by-case basis. Physical and mental maturity is key over there, so the player along with their families and advisors need to make the call on whether they are ready or not. Being released was definitely one of the tougher moments in my life. All I’d ever done was play baseball and it was all I ever wanted to do. At the time I felt like my dreams had been crushed but as life goes, I had to pick myself up and dust myself off and keep pushing forward. 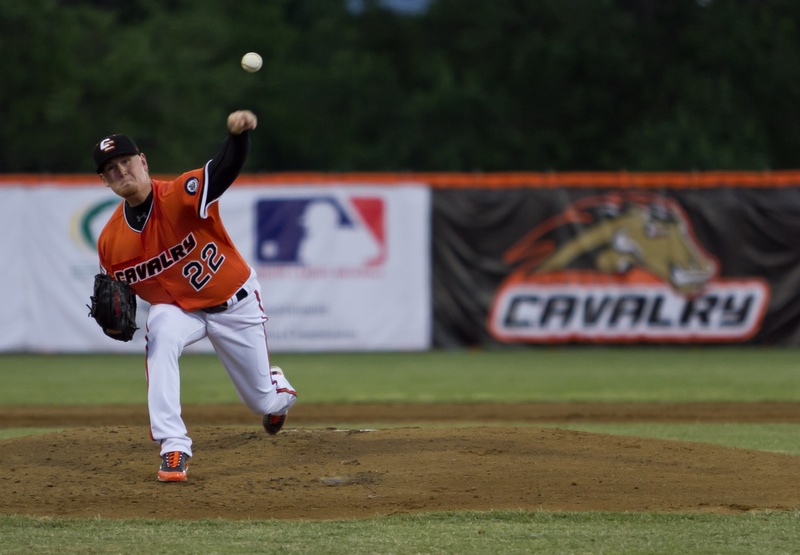 After leaving the Braves, you decided to head back home and join the Canberra Cavalry, a brand-new franchise in the new professional Australian Baseball League…It must have been a special feeling to play pro baseball in your home town? Playing at home in Canberra is my favourite place to play. While we don’t have some of the amenities that a lot of the places I’ve played at in America have, I get to play with guys I grew up with playing with, some of my best friends on this planet. I get to play in front of my family every day. I get to go home and sleep in my own bed at night. I get to do the little things like drop my kids at school and I get to see my wife every day. You really miss things like that when you are so far from home. People of Canberra are so passionate about the Cavalry and really get behind us; it makes me so proud to be from this community. I can always feel how many people from my hometown are behind me, wishing me well in my career in America. It’s like the people here want me to make the big leagues just as badly as I want to. I really hope one day I can do it for myself, my family and everyone here behind me in Canberra. With the MLB supporting the ABL and Minor Leaguers taking part during their winter break, how do you imagine the evolution of Australian Baseball going forward, on a Domestic and International level? Every year that the ABL has been in existence the level of play has gone up drastically. MLB clubs are sending out better players, which in turn are making the local Australian players step their game up. Australian baseball is in good stead with the people we have steering the ship now. I think we are going to keep putting in better and better performances in international competitions because previously once Aussie players got released from their MLB clubs they had nowhere to go play and the sport would lose them because they would have to go off and get jobs and in turn our national team would lose them. Now the ABL has provided a place for players to stay in the game after they’ve been released and get better at their craft. The ABL also gives current pros a competitive league to play in, in their off-season to keep getting better. In a country known for its love of sport, do you think the Australian public could be ready to take on Baseball on a large scale? I think baseball is always going to be a minority sport in Australia. It’s tough to break into the mainstream with such established sports as Rugby League, Aussie Rules, Cricket and even Soccer now getting all the media coverage. I think Australian’s would really embrace baseball because it is such a great sport. You just need to look at the success of the MLB Opening Series here a few years ago. The public loved it; the games were sold out because that event was really pushed in the media. But I think if you asked an everyday Australian walking down the street if they had heard of the ABL they wouldn’t know what you’re talking about because the media are so hesitant to report on it because it would be catering to a small market. But in order for baseball to grow we need their help. As well as leading the charge for the Canberra Cavalry, you have been a pillar of the Australian National Team for years now, including a fantastic display at the 2011 World Cup (1 win and 2 saves, to secure fifth place in the Tournament). How important is it for you to represent your country? Nothing makes me prouder than being able to throw on the Green and Gold jersey and represent my country. It’s a feeling you can’t even explain. I take such pride in it and never take it for granted. I will continue to make myself available to play for my country for as long as I possibly can. Four years ago, Team Australia didn’t play badly but failed to take a single win in the 2013 World Baseball Classic. What is the objective for this year’s tournament, in a group including two international powerhouses – Cuba and Japan – and two outsiders – Australia and China -? This year we are really pushing to make it through to the second round. We’ve been lucky that all our Major League players have made themselves available for the tournament so our team should be as strong as it can possibly be. We’ve always played really well against both Cuba and Japan, so hopefully we can steal a game off either of them and also beat China and push our way through to the second round. We really do have the confidence and believe we have the team to do it. We’re known for being a gritty team that does whatever it takes to win and this WBC will be no different. If we can get through to the second round then you just never know what could happen from there. Players such as you, Travis Blackley, Liam Hendriks, have played along some of the best baseball players in the world. How can you transmit that experience to the youngest members of the squad, as Team Australia gathers to prepare the WBC? We have a really good group of leaders on our Aussie team who lead by example. I think the younger players will just be relayed the message that they don’t need to do anything more than what they are capable of. They were picked on the team because they have the ability to play at this level and all they need to do is play like we all know they are able to. Excuse me if I made you sound older than you are with that last question ;). But you are still only 27, already highly experienced, and back to the Braves organisation? Was it an easy decision to make, when you were offered a return to the grind of the Minor Leagues? After I got released by the Braves, after only making it up to Low-A, I always felt like I had unfinished business and that I never really got to where I was capable of. I felt like I had let the Braves down and didn’t live up to expectations and that was a feeling that never left me, no matter how long I had been out of the game. I wanted to get back into pro ball so bad but after a few years had gone by, then hurting my elbow and requiring Tommy John surgery I really thought my chance was over. I came back and played in the ABL strictly to get the competitive juices flowing again. Never did I think I would get a chance to sign again. Once I started doing pretty well and getting a few teams talking to me about whether I was interested in coming back and playing in the US I was initially in a bit of shock. I knew I still wanted to play but it was a really tough decision as to whether I should. My wife and I were settled, my son was in school and we didn’t know this at the time but my wife was also pregnant with our daughter. It was a tough decision to leave them for six months but my wife was absolutely awesome and knew how much I wanted to do it so she encouraged me to go and follow my dreams. I have to give her a lot of credit because she’s the one that has the hard job of taking care of everything while I’m gone but she took it all in her stride and supported me all the way. Ten years down the road, your outlook to life and professional baseball world must have changed in more ways than one. How has your approach of the sport changed since you first made it to the minors? This might seem weird but my first time around in pro ball I think I actually cared too much if that’s possible. I felt like making it to the big leagues was everything and if it didn’t happen then I was a bust. I put a lot of pressure on myself. I probably wasn’t a great teammate because I always wanted to be better than everyone else. I think I made it into too much of a competition. This second time around I went in with no expectations. I was just happy to be there. I wanted everyone to do well. I knew that no matter how good everyone else was doing, as long as I was doing everything I could then it would all turn out ok for me. So I have much better relationships with my teammates now. I got along with everyone previously, but this time I really made some true friends. I was so happy when teammates got called up to the big leagues. I never got jealous. In my time away from the game I also went out and got a real job, so I now have experience in the corporate world that I have to fall back on if baseball doesn’t work out. So I’m not stressing about what happens if I don’t make it anymore. It makes baseball so much easier when you don’t feel under huge amounts of pressure. So, with the injuries forgotten, a spot in the AAA roster for 2017, it seems that the MLB Dream is well and truly back on track? Are you ready for that first jog out of the bullpen? Bonus Question : Who is going to win the 2017 WBC?